Amarnath,Amarnath Yatra, Amarnath Tours, Pahalgam to Amarnath, Srinagar to Amarnath Tour, Pahalgam to Amarnath Yatra Trek,Trip to Pahalgam Amarnath. The trek from Pahalgam to Amarnathji cave is on an ancient peregrine route. The 45 - km distance is covered in four days, with night halts at Chandanwari, Sheshnag (Wawjan) and Panchtarni. The distance from Pahalgam to Chandanwari (16 km) is now covered by motor transport. The pilgrims camp here or at Pahalgam on the first night out. The first day's trek of 13 km from Chandanwari is through spectacular, primeval countryside. The main centre of attraction on this trek is Sheshnag, a mountain lake which derives its name from its seven peaks, resembling the heads of a mythical snake. The journey to Sheshnag follows steep inclines up the right bank of a cascading stream and wild scenery untouched by civilisation. The second night's camp at Wawjan overlooks the deep blue water of Sheshnag lake, and glaciers beyond it. The lake is also associated with legends of love and revenge, and at the camp these are recounted by campfires, to the stillness of a pine-scented, Himalayan night. Duri ng the yatra, stages of the walk are carefully controlled by the Indian authorities. The first stage of the trek is to Chandanwadi, the second to Sheshnag and the third over the Mahagunas Pass to Panchtami. Many pilgrims visit the cave from Panchtami and return to Sheshnag the same day, walking back to Pahalgam on the fifth day. The trail leaves Pahalgam on a bitumen road, past the Shankar temple and along the east Liddar valley. The trail is easy to follow indeed it is suitable for jeeps as far as Chandanwadi (2,900m). There are many obvious short cuts on the route, and a number of tea stalls, as this first Day always seems to be quite hot. The campsite is in a pleasant glade just before the main line of tea stalls. From Chandanwadi the trail winds steeply for 500m to the summit of ridge known as Pisu Top (3,390m). From here, there are commanding views back down the valley to the mountains beyond Pahalgam. During the main pilgrimage, the tea stall owners do a thriving business, which keeps the pilgrims going on the long incline to the next main resting area at Wawajana (3,550m). From here it is two to three km further to Sheshnag (3,720m). The glacial lake is set in remarkable surroundings, its waters reflecting the snow capped peaks of Vishnu, Shiva and Brahma. Rumour among pilgrims has it that the lake is inhabited by a serpent of Loch Ness monster proportions, so it's advisable not to camp too close to the water's edge. The trail gradually ascends from Sheshnag with magnificent views of the mountains immediately above. The ascent towards the Mahagunas Pass winds up to a grassy plateau, and from there on to the pass it is a further hour's climb. The sign at the top of the pass states the height as 4,270m. It is not a dramatic pass, but it is still no mean achievement for the pilgrims, many of whom have never been beyond the Indian plains before. The descent to Panchtarni (3,450m) is quite long and tiring, but there are frequent flowered meadows to rest in and admire. The campsite can be seen from afar; and behind, on a further ridge, the bare, treeless mountainscape resembles the terrain on the far side of the Himalayas. There are more spacious campsites upstream from the main camping area, and these are also a little cleaner. The actual time to the cave will depend on whether one's trek coincides with the main pilgrimage. During the pilgrimage an early start is essential, with many of the pilgrims move more steadily and slowly than on the rest of the trek, as if in awe of their surroundings. The climb to the Singh Pass (3,850m) is gradual before the trail enters the Amarnath valley. It descends to a permanently blackened snow bridge, which fords the Amarvati stream before ascending the true right back to the base of the mountain. From here the final ascent is up a series of concrete steps to the entrance to the Amarnath Cave (4,050m). The J&K police manning the entrance to the cave only permit a limited number of pilgrims inside at any one time. Many pilgrims return from Panchtarni to Chandanwadi in one day. After completing their pilgrimage to the cave most are happy to trek as far as they can the following Day. 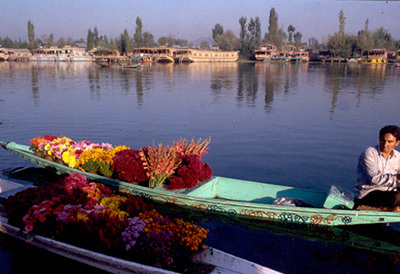 On the final Day most pilgrims arrive back in the Pahalgam bazaar with enough time to complete the drive to Srinagar or Jammu the same day.